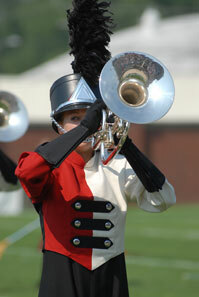 Ames Field is a venue that seems hand-tailored for drum corps. Steep stands, a field that comes right up to the spectators, and a friendly, small-town feel made it a perfect host stadium for the first ever Open Class World Championship Quarterfinals. Twenty-three Open Class corps took the stage at Ames to qualify for the Open Class Semifinals, to be held Friday, Aug. 8 in Bloomington, Ind. 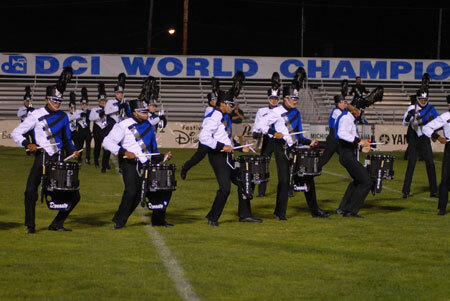 Ultimately, it was Blue Devils B who rose to the top of the Open Class, taking the gold medal with a score of 95.150. West and East clashed for second and third, as the Santa Clara Vanguard Cadets (2nd, 93.800) edged out the Jersey Surf (3rd, 93.550). Blue Devils B's 2008 production "Flight" took off at the Quarterfinals, propelled by a powerful drum line and nuanced by solo work from the horns. When finally airborne, the corps encouraged the audience to sit back and relax to some jazzy strains and smooth percussive grooves, while the color guard dazzled spectators with dual flag work. The corps climbed even higher, buoyed by trumpet soloists who explored their upper registers, and then rattled the stadium with clashing turbulence and high-flying guard equipment. It was a safe landing for BDB, who took first place overall finishes in all three captions (General Effect, Music and Visual). The Vanguard Cadets presented a program steeped in contrasts. At times lyrical, at other times primal and powerful, their "Perspectives" production is symphonic and often subtle. Vanguard Cadets certainly capitalized on sudden shifts of perspective, with jerking body movements and shifts of mood keeping fans in the audience guessing what would come next. But the powerful ending and signature cymbal "V" left no doubts about the identity of the corps on the field. Identity was also the topic of the Jersey Surf's production, "The Jersey Surf: So Far." The top color guard of the evening added bright costuming and exciting tosses, while the horn line from the Surf took top honors in their sub-caption, unleashing on the audience in "park and blow" segments that filled the stadium. Detail is the name of the game in Surf's program, with blink-and-you'll-miss-it stick tricks from the percussion, divided note runs in the horns and a bevy of featured tosses from the color guard. Teal Sound (4th, 92.400), Oregon Crusaders (5th, 92.025), Spokane Thunder (6th, 89.400), Citations (7th, 89.300), Revolution (8th, 86.225), Raiders (9th, 84.950), Dutch Boy (10th, 84.750), Memphis Sound (11th, 84.200), Yamato (12th, 83.600), Velvet Knights (13th, 81.700), Spartans (14th, 81.625), Legends (15th, 81.575), 7th Regiment (16th, 78.025) and Impulse (17th, 77.500) all qualified to move on to the next competition in Bloomington, Ind. In the International Class, Beatrix (86.200) also qualified for the Open Class Semifinals. "This is the most phenomenal group of young people I've ever worked with," said Vicki Schaffer, director of the Colt Cadets (18th, 76.125). "They're inspiring every day in every way and we've worked hard. Their conviction and courage, and their performance today was incredible. We speak a lot within the corps about the meaning of life. The meaning of life to us is to inspire and be inspired, and the fact that 85 young people, no one over the age of 18 can inspire and move you on a daily basis is incredible. If anyone doesn't have faith in our future leaders, look on the field, they're out there." The Racine Scouts (19th, 74.300) got the audience tapping their toes with their "Frankly, Sinatra" program of instantly hummable tunes from that iconic crooner. Corps manager Andrea Birbilis said, "In the seven years I've been with the Racine Scouts, this has been the most fun. The kids are just outrageous, lots of fun. It's been a great learning experience for us. We retained a lot of kids [from last year's anniversary year] and we recruited in Texas. The average age has moved up 2.5 years. We got a new trailer, a new bus … It's been quite the year!" Str?¤ngn?¤s (20th, 71.050) overcame many obstacles this year to travel from Sweden and perform as part of the Drum Corps International Summer Tour here in the United States. Lars ?–stlund, on the board of directors for the corps, said, "Str?¤ngn?¤s [the city] is a little place on earth where there's only 30,000 people in that area, so we're so happy we could manage to make a corps this year. There are just 32 people in the corps. We don't have music in schools [in Sweden] with band programs and marching staff." That's why the corps' program, "Against All Odds," fit so well, said ?–stlund. This was their third tour of the United States, and Str?¤ngn?¤s received their highest score yet this summer. Les Stentors (21st, 68.275) conveyed adventure and excitement in their production "Sinbad – The Legend of the Seven Seas." Les Stentors member Marie-Marchelle Veillette started performing with the corps officially in 2005, but she has been on every tour with Les Stentors since she was five years old. Now at age 13, she's been in a drum corps for 9 years and will "age out" with a whopping 17 seasons of participation under her belt. Veillette said, "My favorite moment was after the show today, people were crying and happy." 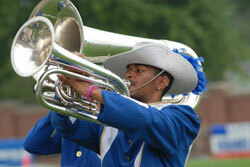 Sydonia Daniels is a third-year member of the brass section with Spirit of Newark/New Jersey (22nd, 67.450). When asked about marching with her corps, said, "It's just been wonderful. The staff is great. The environment we work in is wonderful. It's just a good motivator, because in Newark, there's not a lot of positive stuff going on, so we try to show other kids, other generations how we can rule the world." Their program, "The Urgency of Now/The Human Experience" stresses making the most of your time in the world. The 17 qualifying Open Class corps and Beatrix from the International Class will take the field at Memorial Stadium in Bloomington, Ind. on Friday, Aug. 8. The top 12 corps from that event will move onto the first-ever Open Class Finals on Saturday. With assistance from Christina Mavroudis Dempsey. Photos by Johnny Gilbert.